Song of the day: Secret Friend – "Time Machine"
I was recently contacted by Steven Fox, a charming young Australian fellow who has made an album featuring an awful lot of American power pop musicians. He called this project conglomeration ragtag bunch of ne’er-do-wells band Secret Friend, and the album is Time Machine. I’ve listened to the album a few times now (is seven a few? ), and enjoyed it every time. Instead of pestering each song individually, I’ll offer a short-ish review of the album that will consist of positives and negatives. Time Machine will appeal to people who grew up with the music of the 1970s. I can only think of one negative (see above). Oh, I just thought of another. Some of the orchestral instruments aren’t terribly well recorded. They occasionally sound like MIDI instruments more than real-live oboes, cellos etc. It’s usually at this part of a blog post that I comment on each song individually, but I won’t do that here. One reason is that I hear the album as one entity, not a bunch of songs (even though it is technically a bunch of songs – but you know what I mean). I wouldn’t want to single out any particular song(s) for some reason (usually trivial). Another is that this post is already long enough. Oops. It’s occurred to me that I hadn’t talked about Steven and how, as an Australian, he came to be in America recording an album with a bunch of Americans. Rather than me writing ineptly about Steven’s Stateside Saga™, how about I let Steven do the talking via his (slightly edited by me) press release? 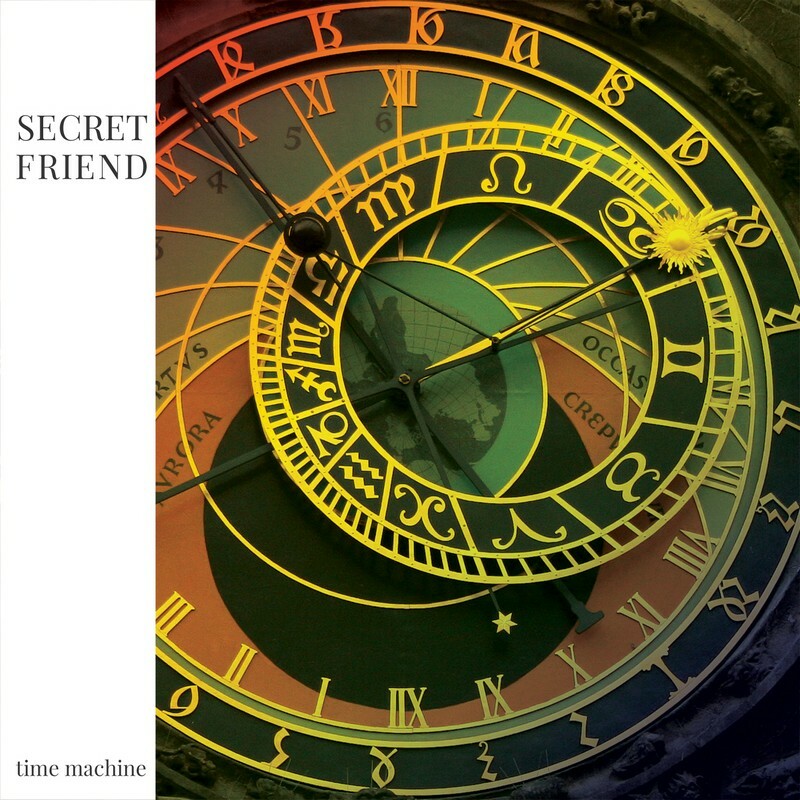 Sydney, Australia (9 January 2013) — Sydney-based Secret Friend today has launched their debut album Time Machine, available now on CD, iTunes, Amazon and other major online services. Recorded last year in Los Angeles California, Time Machine is the unique pairing of Australian songwriter, Steven Fox, with acclaimed American producer Linus of Hollywood. The result is 12 exceptionally crafted and original pop songs which might have been found on a lost Wings or Nilsson album. Linus of Hollywood on guitars. John Hill (producer of Margo Guryan‘s classic 1968 album Take a Picture) contributed orchestral arrangements on several tracks. Lyrically, Time Machine explores a lot ground – from lost love to vehicular homicide, from time travel to compulsive masturbation, from first degree murder to living on the moon. With such topics it would be hard to consider this as an auto-biographical album, “But there are actually a couple personal songs on the album. One of them is ‘The Elephant in the Room‘ which is about a happily married couple getting on in years but still behaving like they did when they first married – meanwhile their friends are raising kids and begin to distance themselves from that younger lifestyle. That’s absolutely what my wife and I have experienced. Another one is ‘Oblivious‘, which I wrote for my wife’s birthday quite a few years ago. When I first played it to her, her immediate reaction was, “So that’s what you’ve been doing?? Why haven’t you been looking for a job? ?” She was right, of course, but that really stung. So I immediately found a new job and totally gave up on music. I didn’t even pick up a guitar for 5 years. She eventually started encouraging me to pursue music again, and even gave me the green light to quit my old job and record this album. This entry was posted on Monday, February 4th, 2013 at 5:30 am and is filed under 2000s, Secret Friend, Song of the day. You can follow any responses to this entry through the RSS 2.0 feed. You can leave a response, or trackback from your own site.